Charles E. Hart. 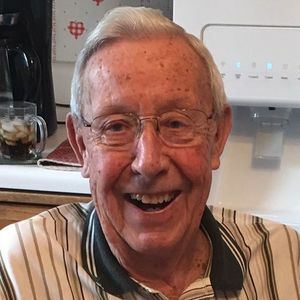 Age 89, passed away at St. Mary's hospital in Madison on Sunday, March 17, 2019, surrounded by his family. He was born on January 6, 1930, in Marshall, the son of Earl and Ella (Jaeger) Hart. Charles graduated from Marshall High School in 1948, and from the Wisconsin Institute of Mortuary Science in Milwaukee in June 1951. Charles served in the United States Marine Corp. from 1951-1953. Charles was also a member of the Marshall Fire Department, American Legion Post 279, Village Board and School Board. On May 17, 1952 Charles married Helen Crossman, and they celebrated 64+ years of marriage. He and his wife owned and operated Hart's Home Furnishings and Funeral Home for 35 years, retiring in 1991. He enjoyed golfing, gardening, playing cards, puzzles and traveling to Sebring, FL during the winter months, but most of all, spending time with his family. Charles is survived by his three daughters: Cindy (Terry) Auchtung, Sally (David) Waddell, and Terri (Jeffrey) Wilke. Lovingly called "Gramps", he is also survived by seven grandchildren: Tamara (Paul) Poppert, Jeramie (Heather) Auchtung, Heather (Matthew) Peters, Tiffany (Joshua) Howell, Danielle (Jim) Burnham, Skyla (Brandon) Witkowski, and Jaden Wilke. He is also survived by seven great-grandchildren: Tanner and Madison Poppert, Savannah and Trinity Auchtung, Wyatt and Wilton Howell, and Finn Burnham; a brother-in-law Walter J. "Bud" Crossman; sister-in-law Margery Crossman; and other relatives and friends. He was preceded in death by his wife; parents; two sisters, Marcella Langer and Sylvia Beckett; a granddaughter Dana Waddell; a grandson in infancy; and a great-grandson in infancy. Funeral Services will be held at the Marshall United Methodist Church, 318 William Street in Marshall at 11:00 a.m. on Saturday, March 23, 2019. Pastor Heidi Loomis will preside. Friends may call at the church from 9:00 a.m. until the time of service at the church on Saturday. Burial will be at Medina Cemetery. Cindy, Sally and Toni, so sorry for your loss. Your dad helped us and so many other Marshsll folks through the worst times of our lives with so much compassion and care. Know that all of us are holding you in our prayers.